In the stitching world, a floss toss is used to decide what fabric to use for a given project. Normally you take the required floss and place ('toss') them on several possible fabrics and the one combination you like most, is usually the one you use for stitching. 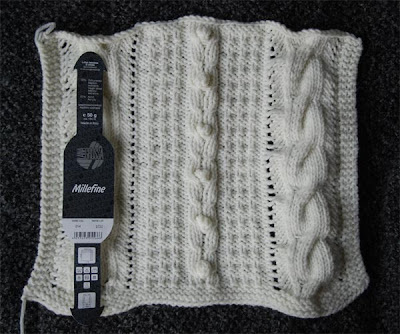 With the Great American Aran Afghan, which I plan for my next knitting project, I decide on something similar. I did spent some time last Friday in my LYS looking at options. I knew several requirements and wishes. A) the yarn shouldn't be too expensive. 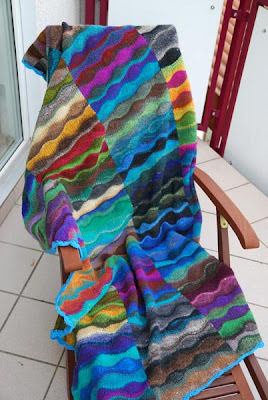 I'm going to need (if I make the afghan exactly as described by the booklet) at least 3600m of yarn. At 100 ~ 120m per 50gr ball, I'll end up buying at least 30 balls. As I plan on doing a somewhat bigger version, I will end up with even more then this. B) the yarn should be maschine washable. As I will make the afghan in off-white, stains will be very visible. C) I'd like to have some natural fibre in it. Wool, cotton, bamboo, whatever. I ended up with a small basket of maybe six or seven yarns (don't you just love a yarn store that even gives you a selection like this) and ended up with three to take home with me to do some swatching. Of the first and the last I've made a swatch (with one of the patterns from the booklet) and then washed it. 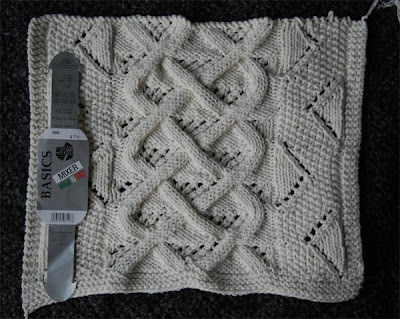 I seriously do love the cotton feeling of the second swatch, and it suffered not at all from washing (which I see the biggest problem with knitting with cotton), I guess due to the acrylic content. 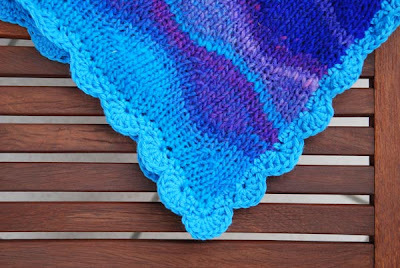 The pattern just pops better with the cotton mix and the color and feel looks to be closer to the one on the photo of the cover of the booklet. It's done. The Lizard Ridge Afghan is finished and I'm in love. What's not to love? Even though there was no way of knowing it, the colors work great together. Even the occational really odd color just fits in somehow. And there are plenty of odd colors in there. For the edging I followed the instructions, and I love it as well. Aren't those little waves super cute? The wool is even the recommended one. I picked it up in San Francisco a couple of weeks back. As I said, I'm in love. 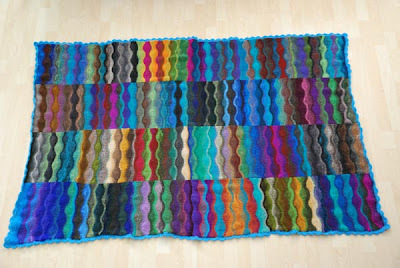 And, I discovered that I really like knitting afghans and so I actually plan on the next one, the American Aran Afghan. In contrast, all in off white. I've got the pattern and already started working on one of the squares to see how I like it. Well, I do like it a lot and I will see about the wool next weekend. I've only have some 100% wool in the right weight and color at home, but in no way enough, and without a chance to get more as I picked it up on a whim a couple of years ago in Scottland. Besides, with the afghan in white, I want something a bit easier to wash.
Second finish is a short top named Bombshell from the book 'Big Girl Knits'. I realize that the picture is a bit ugh. I sort of like it (though not really super happy) and it wears like a dream (the material is a ribbon yarn bamboo cotton mix). I had to go down with the needle size by quite a bit to get the correct cauge even though the yarn should have been okay, and then I guess it all got a bit on the short side length wise. 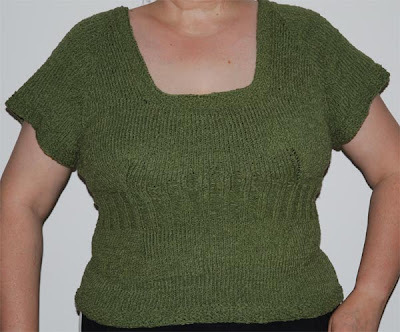 The ribbing looks much shorter than in the picture of the model and I had to extend the lower part by quite bit to have it cover my navel. 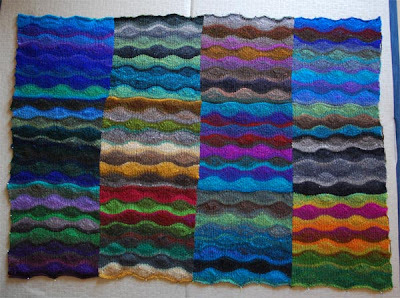 Well, that's as far as I got with the afghan so far. I did finish knitting all the squares, weaved in all the ends (and what a pain that was) and managed to asamble half of the squares. Now to sew the rest together and do the edging. The sewing I'm not looking forward to - not at all. Last year we already plans to go there, but I had to eventually cancel because of work. Luckily this time it worked out. First of, the show was really, really good. 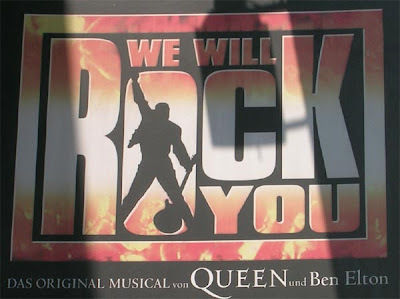 I've seen it in London a few years ago, and the German production doesn't need to hide itself behind the 'original'. Not at all. Very solid performance, good singing, acting and dancing. Loads of fun. At the last number nobody remained on his or her seat. I'd go again in a heart beat. I'm pretty sure we didn't get to see the main cast, but this was no problems. Actually, I liked one of the guys a lot: J.B. in the German production, I believe his role is called Brit in London. Don't know if I'd have liked the main singer as much. I'm making no progress whatsoever on the stitching front, but move ahead quite nicely with my knitting projects. Not much longer and I can start assembling the Lizard Ridge Afghan. No news from my neighbors - haven't seen them in the last two weekends at all. I hope they are still there, but I'm a bit afraid they've abondoned the nest in the meantime. I stay on the lookout.